Several weeks ago I published a tutorial for making quart jar kraut (and TONS of ways to eat it), and it got a great response from my readers. There is just something about sauerkraut that so many people get, no matter what their heritage, whether they grew up with it or learned to love it later in life. Luckily, it's one of the easiest ways to get started with fermenting (not to mention, it's one of those things that tastes so much better when it's homemade rather than store-bought)! In the kraut post, I mentioned how handy it would be to have a tool for beating up the cabbage and for pressing it into a quart jar. Well, guess what? One of my homesteading friends turned a hobby into a business--and this new business features the most beautiful kraut pounders you'll ever see! I could not be more excited to be introducing you to this friend and his new woodworking venture. Eddie has been fiddling around with woodworking for a very long time. 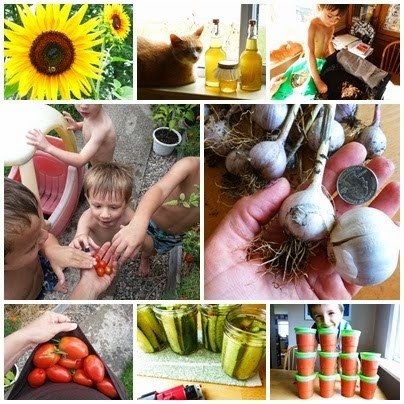 He recently began to experiment with making kraut pounders because his wife, Jo--the other half of the Homestead Chronicles, one of my favorite websites--had learned to make sauerkraut. Jo and Eddie are a phenomenal team when it comes to homesteading. When one of them gets an idea or learns something new, the other is right there helping and supporting, and in this case, coming up with a nice handy tool. If there has ever been a couple to look up to as a true team, these two are it! When word got out that Eddie had starting making wooden pounders and pestles, the interest was immediate. Everyone fell in love with the idea of a kraut pounder made especially for them--me included. With a little nudging from friends, the two turned Eddie's experience and his eye for beauty into an online shop. This is a brand new business run by two of the kindest people you would ever hope to meet, and I'm so excited to introduce it to you! 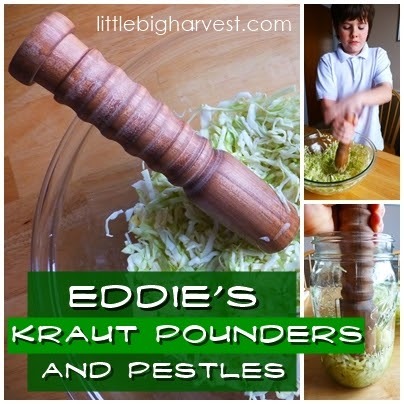 See this video of a kraut pounder being fashioned, by Eddie's own hands! Of course I HAD to get my hands on one of these pounders; I have been learning to ferment food, and sauerkraut is one of my favorites. 1. The craftsmanship is outstanding. It's obvious Eddie has passion and real talent for woodworking. The details are simply gorgeous, right down to the meticulous finish (which you get to choose). When you order, you have several choices to make this pounder your very own unique tool: the type of wood you want, the size, the level of ornateness, and the finish. *note: like any wooden kitchen tools, you will want to take care of the pounder by keeping it conditioned, especially in that first year. Each time it looks a little dry, you'll want to apply another coat of finish. With time, the tool will become well-conditioned. In my case, I chose CLARK'S Cutting Board Oil (affiliate link), an all natural mineral oil with lemon and orange oil--which works well for any wooden kitchen tools you may have. 2. I'm supporting a small business. This is becoming so important today. Many of us love supporting small and local businesses over large corporations. When you support a small business like Eddie's, the product is made with care and the customer service is outstanding. I've had a few questions about how to care for my pounder and Jo came back with answers almost immediately. This pounder is an instant heirloom that I can pass on to him one day. 3. I now have a handcrafted heirloom. I've started calling this pounder my 'instant heirloom'. I have talked to other people who have ordered one of Eddie's kraut pounders and they agree--one woman even told me that her daughter has already asked her if she'll be inheriting the beautiful wooden tool! Handmade tools seem to go hand-in-hand with rediscovering food preservation techniques our grandparents knew. Watching my sons show interest in learning these techniques is so gratifying--the idea of having an heirloom to pass down with the knowledge is the icing on the cake. The pounder gets that brine squeezed out with ease. Now, here is the BEST part. Having a pounder actually makes kraut even simpler. More fun, too! When I've made kraut before, I used my hands to massage and squeeze the salted cabbage, and also tried using a wooden spoon and the bottom of a jar to roughen it up a bit further. Nothing really worked the way I wanted it to. The pounder is well...just MADE for this job! I got more brine, more quickly by using my pounder. In fact, in my kraut tutorial I suggest making backup brine in case the cabbage doesn't release enough of its own liquid, but by using the pounder I got plenty of brine to cover the kraut. The pounder also makes squishing and pressing the cabbage down into the jar much easier. Here's a quick 20-second video of me using my kraut pounder. This thing gets the job done like nothing else! Head on over, right now, to see Eddie's store. OR, what a great gift for yourself! Don't forget to also go and visit Jo and Eddie's homesteading site: Homestead Chronicles. There is a wealth of information to be found, and it's just a fun place to hang out! Thanks so much, Andrea! This is an awesome review and we really appreciate all the hard work you put into it. And we are just thrilled to hear you are happy with your new pounder! Time has changed tremendously since the early manhood when people used to cook entirely in natural environment and today when there is all technology available to help you get your food ready instantly, without much effort. Marriage pearls are treasured heirlooms. In any case, for a first-time purchaser, choosing the pearls can be an overwhelming errand. The manage of the thumb is to pick pearls that can be treasured always; gone from age to age.